Fenty Beauty - Worth the Hype? 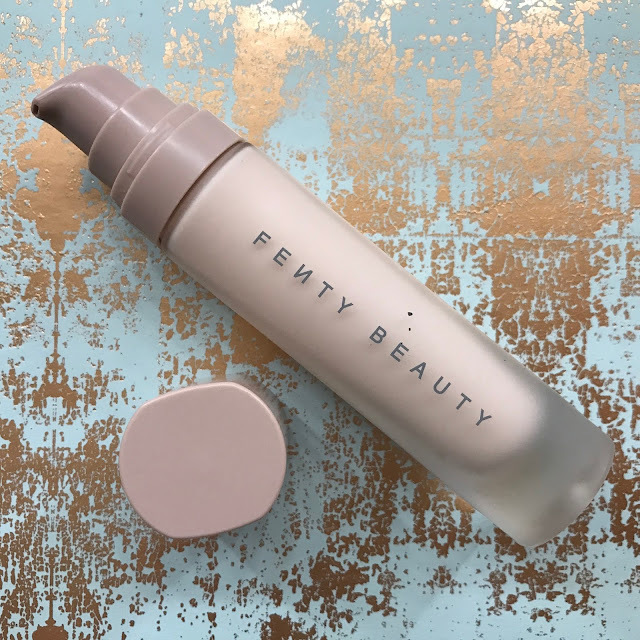 The launch of Rihanna's Fenty Beauty line of cosmetics has gotten many heads in a spin since inception and it's recent release on both sides of the Atlantic has seen an absolute plethora of reviews and first impressions and worth the hypes go online. I'm not a huge Rihanna fangirl but I am a huge makeup fangirl so I duly headed over to Harvey Nichols in Dundrum on the launch weekend to test out the products for myself and of course I purchased a few bits and pieces to try out. I have been trying them out for the last month and I am finally reporting back today on how I found the products and what I think of the makeup in general. Firstly - the things I like and don't like about Fenty Beauty as a brand before we begin. Rihanna and her team decided to come out with not four or five but FORTY different shades of foundation as part of their standing range. Apparently Rihanna wanted the brand to be ridiculously inclusive for all women - from the palest snowflakes to the darkest chocolate girls - which is incredibly commendable. It's so frustrating that some foundations in certain brands are limited to 5/6 measly shades - a 40 shade offering is by any standards impressive. 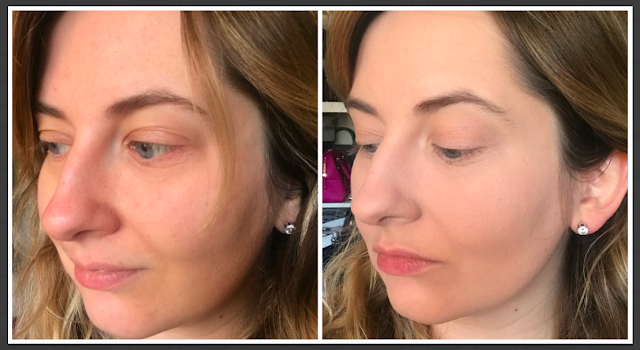 Secondly, whilst there are a huge array of foundations available, there is not much of anything else - a primer, a (single, universal) lip gloss, some Match SkinSticks which are cream stick concealers, blushes, highlights and contours in little bullets, some highlighting/blush duos and blotting powders and papers. 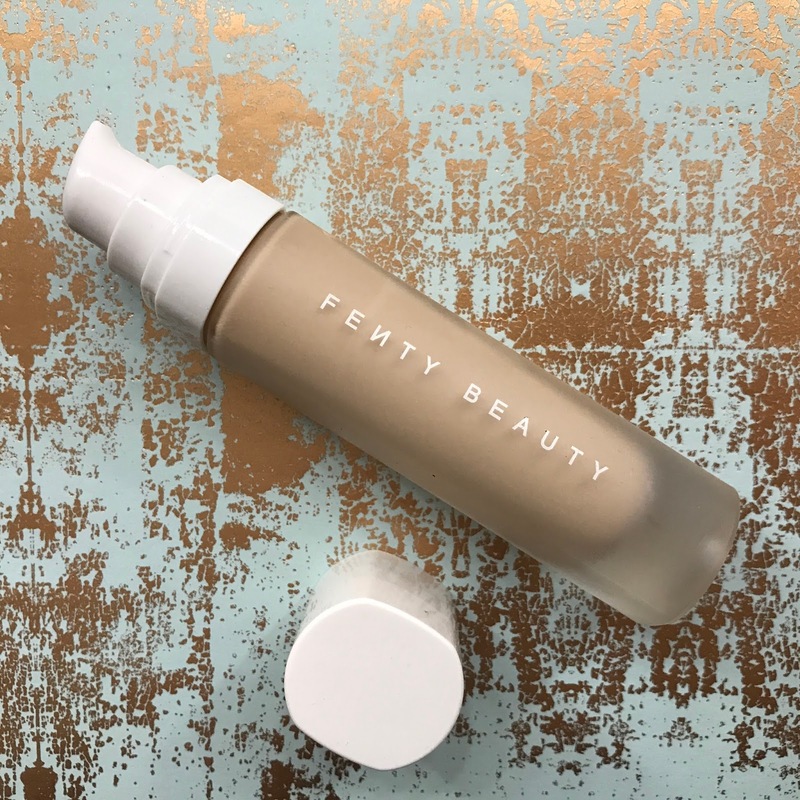 It's quite clear that the initial Fenty Beauty offering is all about the base and achieving that glow - there is very little in the line of colour cosmetics to play with. The stand in Harvey Nichols Dundrum is huge, and the girls on counter were very lovely and very enthusiastic about their product, but there wasn't much on the stand because there is not a huge product line-up. Again, this brand has just started out so I think that's ok and the girls on counter did tell me that new arrivals for eyes and lips were imminent so we won't have too long to wait. The packaging and aesthetic of the brand were quite pleasing - very Bajan beachy with simplistic beige/white packaging and all the powder compacts / Match Sticks / lip gloss come in hexagonal packaging. I don't think the packaging is particularly special or luxe though - it reminds me of the H&M makeup range. I picked up the primer, foundation (obvs), lip gloss (say what?) and a contour/highlight/concealer trio on my first trip. The price point of the products is at the lower end of the high-end spectrum - quite similar to MAC prices - I don't know why but I was expecting it to be pricier and I was expecting Irish gals to get stung by the usual poor exchange rates but that was not the case - hooray! I've really put these products through their paces - I even brought them to Madrid with me on a recent trip - so I feel like I have tested them out under a variety of conditions. I had immediate feels about these products - some good and some bad - and instead of rushing to get a post up in the first week following the launch, I decided to take a longer view to give a more informed review. The first product I want to talk about is the Fenty Beauty Pro Filtr Instant Retouch Primer. I'm not a great lover of many primers to be honest - I hate the feeling of most silicone primers on my skin and as I have quite dehydrated skin, I usually opt for hydrating or glowy bases. This primer appealed to me from first swatch because it's not even remotely siliconey - in fact, it feels rather lovely. It promises a smooth, pore-diffusing finish and extended make up wear. The sales assistant in Harvey Nichols recommended using these only on the T-zone area if you have drier skin like I do but she said this would be a blessing for oilier skinned gals. I would only ever apply primers to the centre of my forehead, down my nose and on my chin anyway. The primer applies nice, blends smoothly but I can't say my pores look instantly diffused - I think they look more diffused but that could be wishful thinking. I've tried this primer with other foundations when I was travelling and my foundation lasted well, even in the 30 degree Madrid sunshine. I definitely like and rate this primer but I don't know if it has changed my life so much that I will rush out to repurchase it - as far as primers go, I really like using it. The next product I have to talk about is the Fenty Beauty Pro Filtr Soft Matte Luminous Foundation - yes, the foundation of which there are 40 shades. I'm not going to dispute what other people have said or their experiences but I will tell you what I think. Everybody is talking about this foundation. I got the shade 170 - I've heard about 5 different people say you need to go in to be shade matched but I matched myself to 170 online before I ever went in store (on the basis I have a light complexion and cool undertones) and it's a good shade match for me but I have noticed after a couple of hours wear it oxidises majorly. It's uncanny how it is such a perfect match when applied but after a couple of hours, I honestly look jaundiced. It promises a medium to full coverage, longwearing and light as air and to be fair, the coverage is excellent, it is pretty longwearing as foundations go, but I don't find it to be light as air. It's not like cement on my face but I wouldn't say I cannot feel it either. This foundation is super matte - not the luminous matte I was expecting. It's matter than my normal foundation choice because I don't often go for a matte look. It's so matte that it's quite thick and I find you have to work with it very quickly to get it blended out nicely on your face before it sets. I've used multiple tools for applying these but my favourite method is buff it all over the face with the Zoeva Flat Top Buffer and bounce a damp beauty blender over the top to set everything in place. I personally don't really love the finish on me but I have been asked 10 times by women I work with / friends on what foundation I am wearing when I have had this on and several of them have actually told me they bought it on the basis of seeing it on me. I can't tell you how much that surprises me because I don't love it on me - because it is so matte and so dry, I find it quite aging on my skin and not the most comfortable foundation ever. The finish, whilst I don't find it to be the luminous matte that some other people have experienced, is pretty flawless by any standards and lasts incredibly well especially on the T-zone. Like I mentioned earlier, I brought this foundation to Madrid with me and I was shocked at how well it lasted - I didn't powder it and I wasn't shining by the end of the day. I have mixed feels about this foundation - I like how it performs and that's why I continue to use it, but I don't like how it feels on my skin or the finish of it before I put on all of my other makeup - the real killer for me is how badly it oxidises on me, I end up bringing it right down my neck and that's a little more effort than I like to undergo with my foundation application. At €33, it's pretty reasonable for a high end foundation and you get 32 ml of product which is a few more applications per bottle than your average foundation. I like the simplistic packaging of the foundation and the fact it comes with a pump. I won't repurchase it when I finish the bottle because of the oxidisation issues. I've seen this compared to the Catrice HD Liquid Foundation also but in my opinion, I don't think they are comparable. 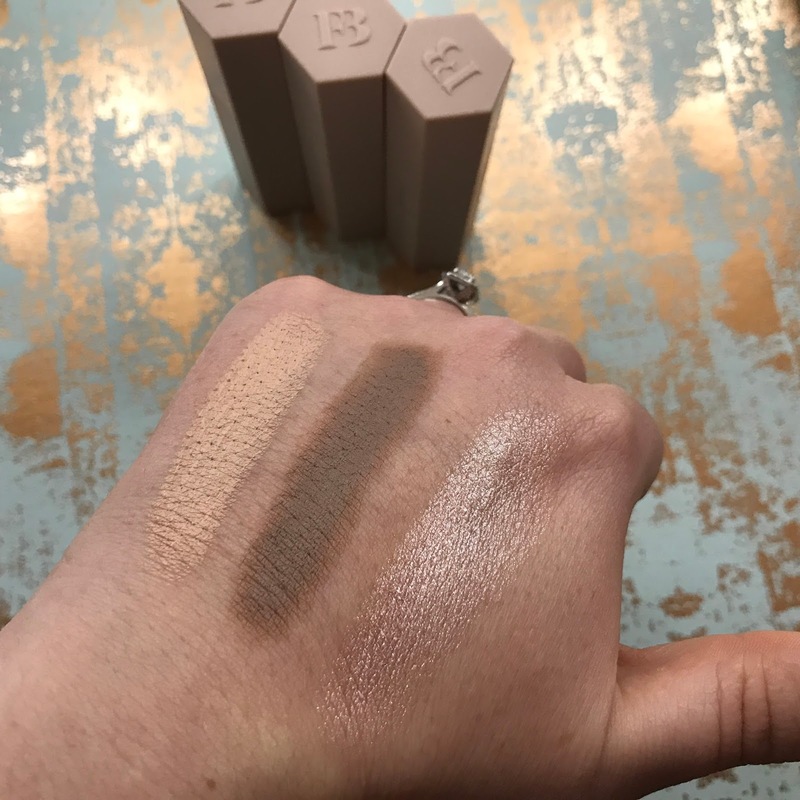 The next product I picked up was the Match Stix Trio in Light 100 which contains a concealer in the shade 'Linen', a cream contour in the shade 'Amber' and a cream highlight in the shade 'Starstruck'. 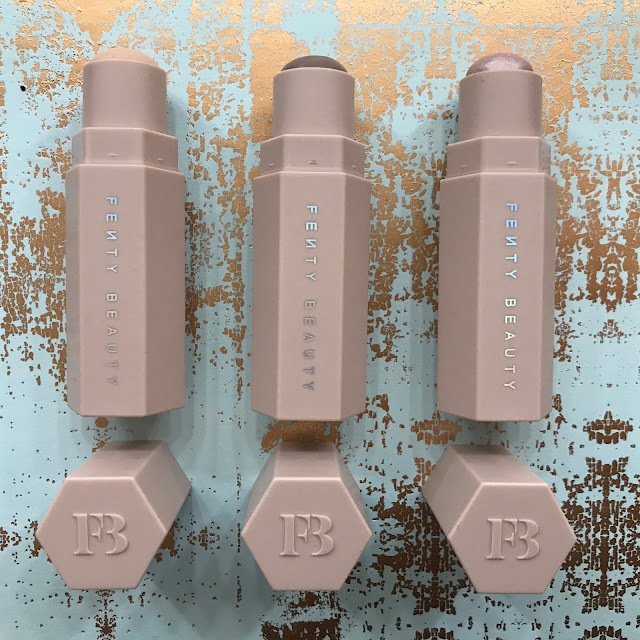 There are a few trios available in the Fenty Beauty collection, they all comprise of a concealer, contour and highlight shade - I went for the fairest set because I was eager to try the products. I think the set was about €52 which wasn't too shabby at all considering one of the items alone is around the €24 mark. I thought the Matte Skinstick Concealer in Linen would look desperate under my eye and even though the lovely girl at the counter tried it on me and it looked fine, I have never once applied it on myself without it looking like scrambled eggs and I have tried so many ways of applying it now that I have just given up on it. The texture of the concealer is quite dry and hard and when you blend it out it feels quite powdery and thick. For a thick feeling product, it didn't cover my dark circles the way I hoped it would, and certainly the coverage doesn't even come near the coverage that the foundation offers. The shade was a good match - kind of peachy toned on me which should work amazingly on the undereyes - and I didn't notice it oxidising over the course of the day. The Matte Skinstick Contour Stick in Amber looked so promising because it seemed like quite a nice cool brown shade but my bugbear with this is that because the product is so dry, it tends to pull whatever else you have on your face with it when you apply it. During the course of blending, I've found it kind of blends away to nothingness. The product is so dry that you have to work quickly with it to get it blended out before it sets - I've used different brushes, beauty blenders, setting sprays etc. to give it a fair chance - but nothing I do has made this apply or blend any nicer. Both of the Matte Skinsticks applied incredibly matte - I thought because of the matte foundation that there might be a little bit of life or moisture in the colour products but this was not the case in my experience. Finally, the Shimmer Skinstick in Starstruck looked like a lovely highlight when I swatched it in store but again, it feels quite dry on the face when you apply it, you have to work with it quickly before it sets and I feel like when this is blended out on the areas you want to highlight that it just looks like glitter particles moreso than the usual sheen or glow that I would prefer. Even though this product is not matte like the concealer and counter, it's quite dry in the bullet, not at all creamy as you might expect a highlighter stick to be. I've never enjoyed wearing this because I just don't like a glittery highlight. All of the Skinstick products for me were complete fails - in my eyes, they have practically zero redeeming qualities - and my advice to you quite frankly would be to save your money. 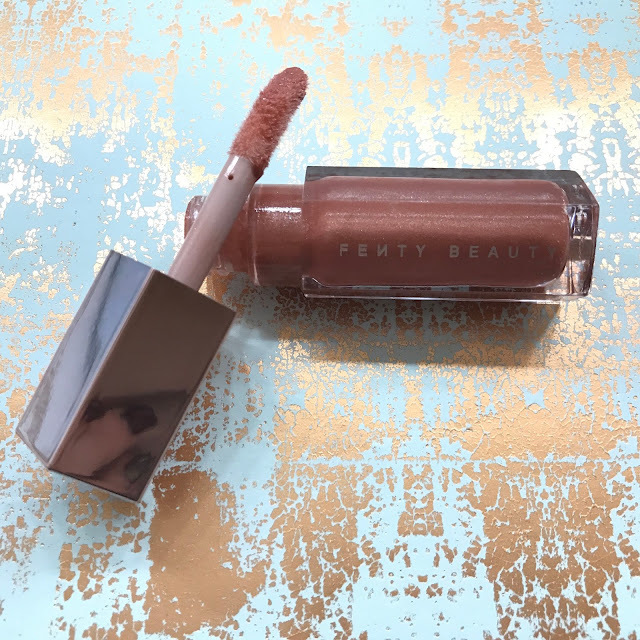 The last Fenty Beauty product I picked out was the Gloss Bomb Universal Lip Luminizer which is the only lip product in the Fenty Beauty lineup so far and it is a glittery lip gloss which just comes in one universal shade. I am not a gloss girl but I was intrigued about a universal lip gloss for all skin tones so I did purchase it - if nothing else, I thought it was gas that Rihanna opted to release a foundation for every shade of skin under the sun but just the one shade of the single lip product. I'm not mad into glosses as I said, but as far as glosses go, this is quite nice. It's not sticky on the lips, the doe-foot applicator is huge so a quick swipe and you're good to go and the little glitter particles are very fine so it doesn't like too childish. 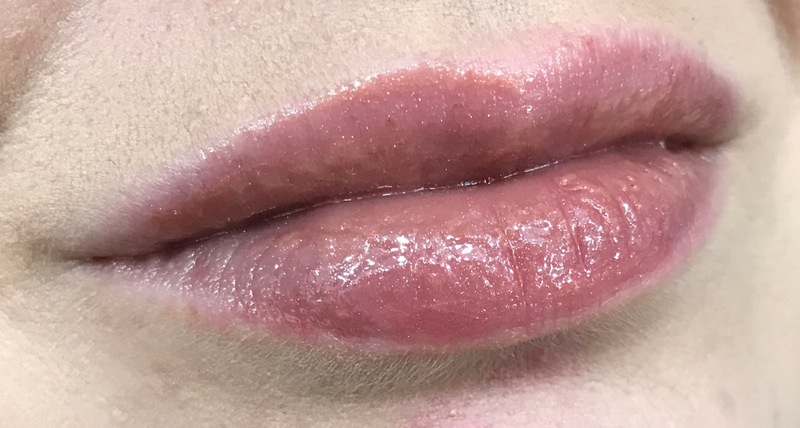 It doesn't last very long on the lips - an hour or two before reapplying for me - but I genuinely think it made my lips look bigger and juicier (particularly when paired with my HG lipliner Charlotte Tilbury Pillow Talk. I'm not going to pretend like this is a miracle lip product because I genuinely don't think that it is, it's a nice lip gloss and that's about the extent of it. If you're interested in owning it, it can be yours for €17. So there is my Fenty Beauty overview - as you can tell, there were many feels on my part, and not all of them were good feels. I wasn't really wowed by any of the products that I tried and I wouldn't fall over myself to pick up any other products any time soon. It wasn't so awful that I am blacklisting the brand but I am definitely guilty of falling for the hype on this occasion. If you haven't picked anything from Fenty Beauty yet, don't let the FOMO get you down. If you're thinking about the foundation, make sure to get a sample to take home with you so you can check to see if / how badly it oxidises on your skin. Don't say I never warned you! Really interesting to hear your thoughts you and you look fantastic!! Fantastic review,thanks! 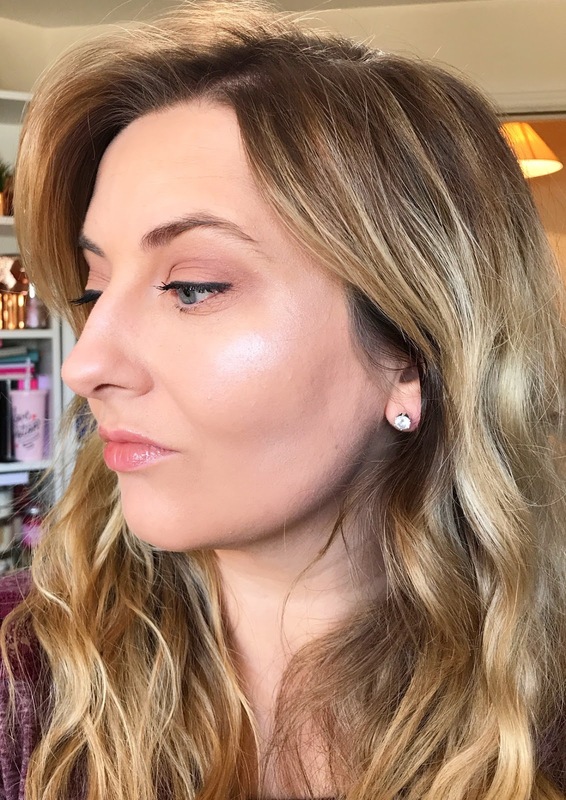 It's such a pity you weren't blown away by the products,but your makeup looks incredible (especially the highlight) in that photo you've posted!